At last! After a month of laying the groundwork and making preparations, we’ve hosted our first social media pilot workshop, and it was a great success. With laptops in the front, piles of paper everywhere, a huge display screen, and a bunch of eager individuals, we managed to cozy up the orderly conference room of the Safir Heliopolitan Hotel in Beirut. The training seminar took place from 9 a.m. till 4:30 p.m. and was attended by representatives from a diverse array of NGOs working in Lebanon. 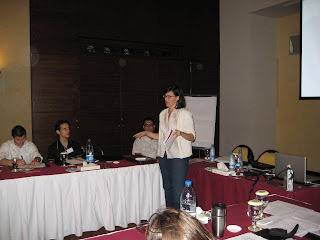 The program encompassed various topics related to using the tools of Web 2.0 for social change. In addition to an overview of the Web 2.0 universe, attendees got basic training in how to set up an RSS feed, a blog, and a social-bookmarking page. After lunch, we discussed the progress of information and communication technologies (ICT) for peace and development and looked at several case studies in how NGOs and others are using social media for social change. An ongoing sharing process, the seminar ended with a lateral-thinking exercise that let them test drive—in theory at least—the tools they had learned.